Traditional textbooks have always taken up a large portion of the school budget, so many schools are turning away from tradition in favor of using tablets and laptops in the classroom. When a school invests in a collection of electronic devices for students, it is essential to have secure storage for these items, and laptop storage carts can provide a home for them when they are not in use. As schools start to notice the wisdom in using tablets and laptops in the classroom, many are no longer ordering traditional textbooks. According to the Times Free Press in “Schools Shift from Textbooks to Tablets,” over 2000 schools have already signed up with Google to use their lightweight Chromebooks next school year. These inexpensive laptops can not only store textbooks electronically, but also allow students to research topics on the Internet and use the software to complete projects and papers. With the influx of new inventory, schools will need to have a system to keep track of the computer devices, keep them secure, and charge them. Storage carts made to hold these devices are the perfect solution for this problem. Some are made for laptops, while others are sized specifically for tablets. The carts have built-in charging stations, and wheels to make them easily mobile. In addition, schools that are entering into this high-tech phase may want to consider different desks as they start replacing older ones. Computer tables with space for two students or cluster workstations where up to 6 students can work at a time have electrical outlets built in so students can charge devices while they work. As schools phase out some of their traditional materials and furniture, new products can be purchased that will continue to promote a learning environment while working with new technology. 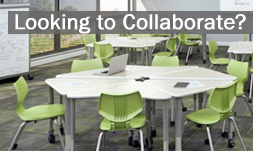 Contact us to find furniture and supplies that will encourage a 21st century educational experience.